Thinking outside the box is always good. Cute idea. Anyone would love to get this card. Sandy – thank you so much for your fantastic card share. You are one talented lady and I really admire you and all that you do. Fun cards… Thanks for sharing. Great cards, that jar stamp is one of my favorites so far! Love your awesome trifold card. love your card… love how you used the jar! Cute card- I love mason jars. I love tri- folds but that center panel always stymies me. Yours is fantastic. Love the jar! Love the cards. Have to have that love jar stamp. Wonderful tri-fold card. Love that jar stamp and will be putting it on my wish list. I think this is a great card; I think this stamp set is going onto my wish list. Love the tri- fold card. I am really enjoying this Hero Arts Blog hop! There are so many wonderful inspiring creations with the stamps. I am drooling over some of them…I am thinking I need to get some of the background stamps, especially the tweed and hexagonal ones! Oh my goodness…your card is over the top with details and delight! I am bookmarking your blog! I really the ideas you shared and .thank you for sharing your talent! I love your card! I also love the folds. Great job! Cute card. I love those adorable hearts. Fun jar image and good idea to use the tri-fold design. Thanks! Your heart jar card is the cutest thing ever! Gorgeous card! Love the unique fold! i have never made one of these types before, so I will have to give it a try with your tutorial 🙂 TFS! Hi Sandy, I am in awe of your ability to transform these stamps into the CUTEST Christmas card ever! Thanks so much for the video, too!!! 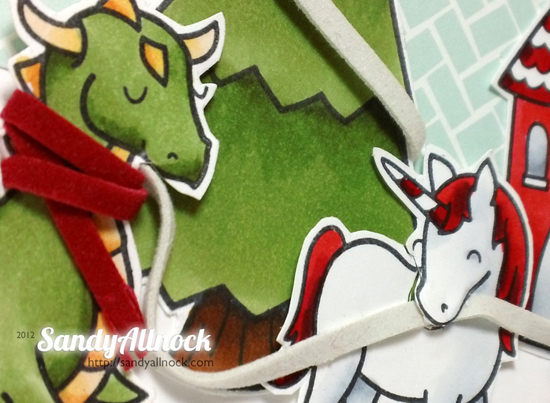 I can tell already that it’s Christmasy by the clever scarf on the dragon and the candy cane horn on the unicorn! I’m going to go to May Arts to get the full effect though – LOL! Very cute card. Like the modified card base. Love your take on the tri-fold card. The hearts and heart-jar looks great! What a cool card – love the colours! This card is amazing. Love the colors. Love mason jars so I knew I would love this card. Cute tri-fold card! Love that jar with hearts!! this is an amazing card, how you find time to create these works of art is beyond me! Looking forward to the other creations! Amazing tri-fold card. Love the colors too. Oh wow what a fabulous card! Amazing design and that jar full of hearts looks adorable! I really love that jar! Thanks for sharing! WOW – the tri-fold card is awesome. I will try that – after I watch your tutorial. Thanks for sharing! Can you say Adorable. What a great card. Great tri-fold card! Love the hearts along the edge too. Thanks for sharing. Lovely card! Great use of color! Beautiful card, loving those hearts! 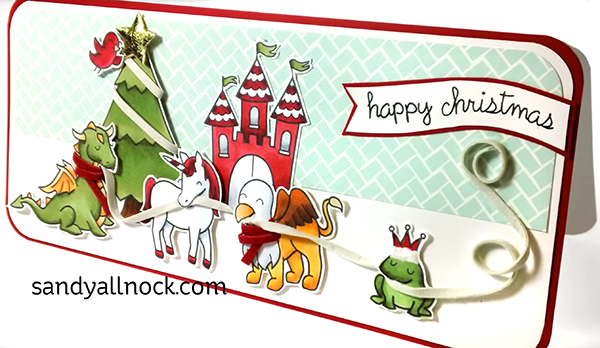 What an amazing tri fold card….so full of detail!!!! Wow! I have never been a fan of the trifold cards but I have just changed my mind! Your creations always have such attention to detail…lovely! Those hearts are so sweet…that card is amazing!